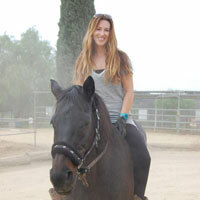 Elle was born in Glasgow, Scotland but currently lives in Los Angeles where she is an actor, photographer and full time horse mom to Equiseq's mascot, Nochera. A life long horse lover, Elle's first childhood mount was invisible but carried her valiantly over her mom's upturned garden pots and broom jumping courses in the back yard. She graduated to riding lessons on real life ponies at 7 years old and was bitten, thrown off and kicked so many times, she willed her first growth spurt into horses. As a teenager, Elle spent her weekends and summers working on a pig farm and at a local Thoroughbred breeding farm where, in exchange for mucking and exercising horses bought from auction, she would get to show and jump horses at the local Pony Club events for prospective buyers. The invaluable lessons from riding various mounts was a great confidence booster and she began jumping other people's horses in the local circuit. Elle graduated from Glasgow University with a degree in Politics and History. After working in a government department for a few years, she threw caution to the wind and followed her dream of moving to the bright lights of Hollywood where her acting career blossomed. Elle bought Nochera (her first real horse!) in September 2013 but soon realized that something was wrong. After going down many dead ends with vets, she opted for muscle biopsy and received the diagnosis of Myofibrilar Myopathy (MFM). Connecting with EquiSeq, Nochera was enrolled for whole genome sequencing where she was the first horse to be identified as heterozygous for a variant of filamin C (n/P3). Elle is proud to join EquiSeq, fueled by her passion to help owners demystify the diagnosis while being an advocate for horses with equine muscle disease. You'd be surprised to learn that ... Elle is more Elf than human.